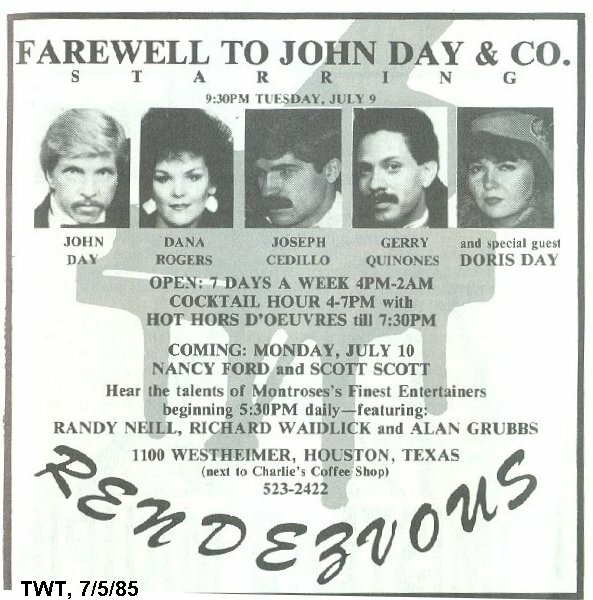 I moved to Houston in 1981, and in my early years here I often saw John Day perform, at clubs like EJ's (then on Richmond, where I tended bar for the summer of 1982) and Baja's (on Lovett Street). As a record collector, especially of the queer variety, he definitely caught my attention when he recorded the official Gay Pride Song, "Unity and More in 1984." I definitely saw him sing that at EJ's, though I didn't track down the actual 45 until many years later. Our own "What a World" & "Dyke Show" Nancy Ford gave me a copy, and shared with me that she helped sing backups (along with Dana Rogers and Richard Askin) on both sides of the 1984 record, and also the one for 1983. I don't think that one made it to disc, but they did sing it at the Summit for the Gay Pride Concert, starring Tina Turner...those were the days. Oh, I'd also like to note that it was just called "Gay Pride" in those years, the alphabet came later. 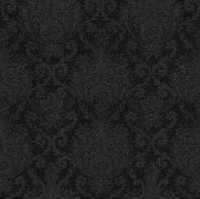 Last summer one of my side projects was to digitize about 60 hours of the KPFT radio show Wilde 'N Stein, from tapes ranging from 1981 through to its last show in 1992. A few months later Lesbian & Gay Voices began airing, changing its name to Queer Voices in January 2002. Anyway, while going through those tapes I uncovered some more John Day goodies, including the 1983 Gay Pride Song, which was called "Unity Through Diversity," and even found a radio ad for the 1983 Pride Parade. You can hear all of these tracks below. 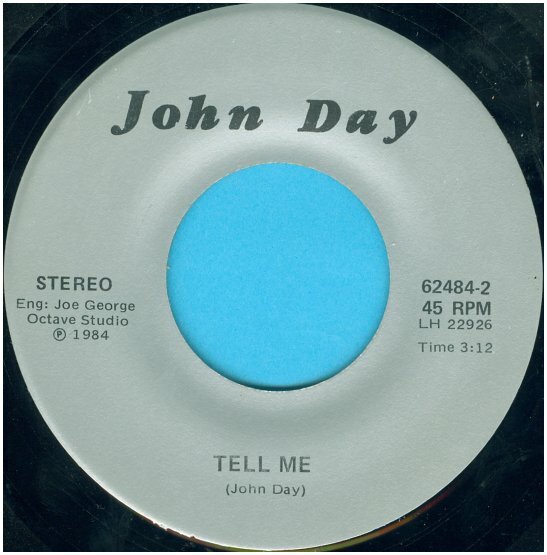 John Day, a prolific pianist, vocalist, composer, and arranger, was the genius behind John Day and Company, a trio-sometimes-quartet that performed largely in Houstons gay bars and cabarets, beginning in 1981. And the gays loved him and his talent. John was born in Knoxville, Tennessee in the early 1950s, and the harmonies he and his sister Doris learned to weave at church were easily transferable to arrangements of pop tunes and standards in a Manhattan Transfer-flavored treatment when they migrated to Texas when both siblings were in their twenties. Johns cousin Joseph was part of JD+C's original trio, with John and Doris. Vocalist Dana Rogers joined the group in 1983 when Doris lost interest. Rogers, a soaring soprano and brilliant musician whose learned her trade in Las Vegas at the feet of her father and renowned Rat Pack arranger and conductor, Bill Rogers. 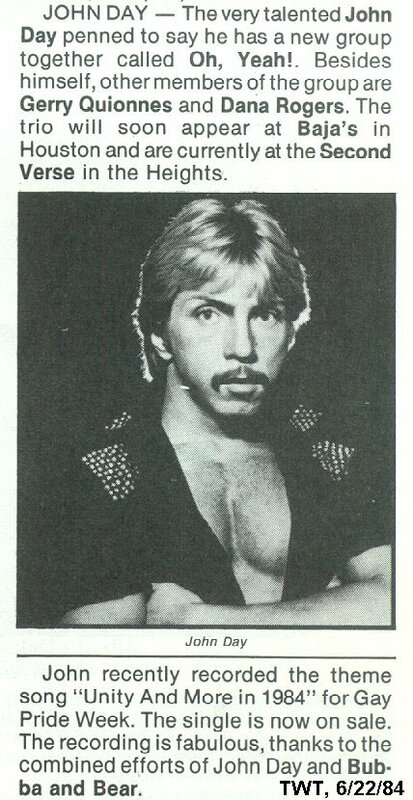 Dana joined the group at just 18 years of age. Jerry Quinones sometimes sat in with JD+C, a fiery little Latino whose specialty number was Bill Bailey Wont You Please Come Home peppered with impressions of Pearl Bailey, Louis Armstrong, and others whom few in the LGBT club demo would recognize now. When John didnt accompany on piano, Richard Askin, who worked as something of an assistant to The Copas owner, Gene Harrington, did. With and without his beloved Company, John Day performed at countless venues in Houston including EJs, Studio 13, The Copa, Baja Sams, Upstairs/Downstairs, Cody's, Rascals, Kindred Spirits, and many other venues that didn't shy away from John's openly gay presentationstill a rarity at that time, even among entertainers, when AIDS was considered a gay disease. John independently recorded Unity Through Diversity in 1983 & Unity & More in 1984 on 45 RPM records both as John Day & Company for Pride Committee of Houstons June Pride celebrations. He also wrote and indepedently recorded the single, There Goes The Neighborhood" in 1984.